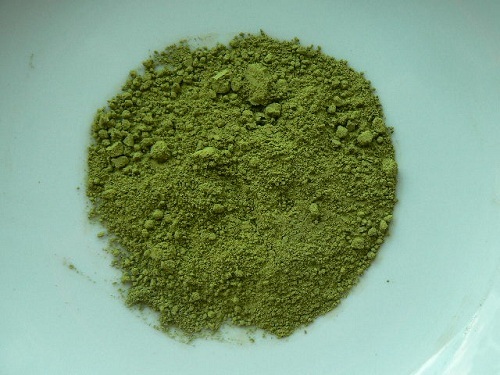 Japanese green tea powder, used in the Japanese Tea Ceremony. Also for culinary uses – smoothies, ice cream, waffles. A jammy-like smoothness with a satisfying cup and a light astringent finish. To hold the flavor and nutrients of Matcha, refrigerate in a sealed container. Matcha contains higher levels of nutrients than other green teas because the tea leaf remains in the tea and is not strained out before drinking. Cottage Garden Teas is again sourcing our matcha from Japan, in the southern region, south of the mountain range which separates it from the dangers of radioactive contamination from the Fukishima nuclear accident. Our Japanese matcha is certified organic, and is of exceptional quality. The tea is grown under Japanese supervision by Japanese growers, and production is carried out with Japanese equipment and methods. Ours is a medium-grade quality, with good flavor at an affordable price. We do not use a “cooking-grade” matcha, as its quality is low, and its taste is inferior. Good tea costs a little more, but quality demands it!